CLEMSON, SC – The Clemson women’s basketball team snapped a six-game losing streak with a 77-71 win over North Carolina A&T (4-7) on Monday night in Littlejohn Coliseum. The Lady Tigers (7-8) shot a season-high 51.9 percent, and Shaniqua Pauldo scored 12 of her 22 points during a crucial second half run as Clemson pulled away. 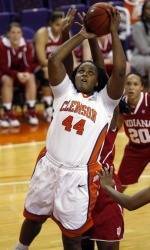 The Lady Tigers will open ACC play on Thursday as they travel to NC State for a 7:00 pm showdown with the Wolfpack. Pauldo scored her 22 points on 9-14 shooting, including 14 in the second half, while senior Kirstyn Wright had 24 points, and tied a school and career record with six made three-point goals. She made her first six attempts, and her attempt at a school-record seventh straight rimmed out in the second half. Wright filled the stat sheet, adding five rebounds, five steals, four assists, and a block in the game. Senior Jasmine Tate also had a strong all-around game, going 4-8 from the field for eight points, and adding six rebounds and a season-high four blocked shots. Bryelle Smith had a season-high nine points, six rebounds, and three steals from the point guard position. Defensively, Clemson had season highs in steals (14) and blocks (11) in the game, and six different players rejected an attempt. Team blocks leader Lindsey Mason also added two. The Lady Tigers forced a total of 23 turnovers. Sthefany Thomas had six points on two three-pointers, which came early in the first half. She also tied a career-best with five assists and no turnovers, and nabbed three steals. Jaleesa Sams led the Aggies with 22 points, eight rebounds, and eight steals in the game. Offensively, Clemson had a season-high 24 assists on 27 field goals, and hit 9-16 from three-point range, a season-best 56.3 percent. The Aggies played a zone for most of the contest, and the Tigers were able to find its post players in the high-post, which helped lead to open jump shots and layups. Clemson’s three main post players combined for seven assists, and guard Chancie Dunn showed strong flashes, recording five assists and one turnover against the Aggies’ second-half pressure. It looked as if Clemson might pull away after a 16-1 run in the first half gave the Lady Tigers turned a 22-14 deficit into a 30-23 lead on a fast-break layup by Wright on a nifty over-the-top feed by Thomas with 4:50 remaining. But the Aggies held Clemson without a point over the final few minutes, and closed the gap to 30-29 at the horn. Wright came out of halftime hot, nailing two quick threes, and giving the Tigers a 37-31 lead, but the Aggies again responded with an 11-0 run over the next two minutes. Clemson then went on another 13-3 run over the next four minutes, capped by Wright’s sixth three, a right-wing swish on a feed from Thomas. Wright had another three during the run, as did Bryelle Smith. Pauldo and Dunn then combined for Clemson’s next 11 points, and the Tigers stretched their lead to eight on a Pauldo layup from Dunn. The Aggies cut the lead to four with just under a minute to play, but Mason put in a layup from Dunn, and Smith nailed two free throws to ice the game, giving Clemson the 77-71 win.